Expat Blog Awards - an annual event run by ExpatsBlog.com, where a gold, silver and bronze award go to the top 3 blogs in each country. We're continually finding fantastic new blogs to add to our extensive directory, and so don't be surprised if you receive a rewarding email! For help adding to Wordpress/Blogspot hosted sites and some alternative badges click here. Should you want to nominate your favourite blog please get in touch and we'll be more than happy to take a look at it. 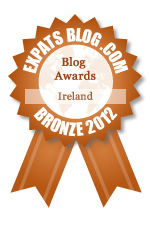 To qualify, the expat blogs must have been submitted and approved to be listed within this site. Once approved, each expat blog will have a dedicated listing page where fans can leave a appreciative comment. We have a nice Top Blog graphic to add to your site, which should encourage fans to leave some love! The Expat Blog Awards 2012 judging was largely based on peer-voting (i.e. fan comments). This also dtermines the country page listing order so it's a great idea to get some of your regular readers to leave a note on your blog listing page. 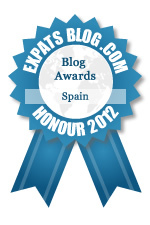 Expat Blog Awards 2012: Please click here for the Expat Blog Awards 2012 Winners Page. "Thank you so much for the award. It has been great fun to follow, and I have read some really great blogs I would not have found if it were not for the site. It has also been so nice to read the comments that people made about my blog, most of whom I do not know. Makes all the hard work that goes into it worthwhile." Lindsay - What about your saucepans?